VJ Books Presents Author Ken Follett! 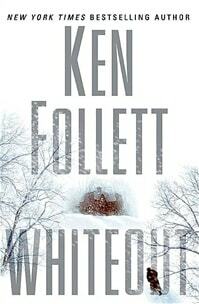 Ken Follett was born on 5 June 1949 in Cardiff, Wales, the son of a tax inspector. He was educated at state schools and graduated from University College, London, with an Honours degree in philosophy. He was made a Fellow of the college in 1995. He became a reporter, first with his home-town newspaper the South Wales Echo and later with the London Evening News. While working on the Evening News he wrote his first novel, which was published but did not become a bestseller. He then went to work for a small London publishing house, Everest Books, eventually becoming Deputy Managing Director. He continued to write novels in his spare time. Follett burst into the book world in 1978 with Eye of the Needle, a taut and original thriller with a memorable woman character in the central role. The book won the Edgar award and became an outstanding film starring Kate Nelligan and Donald Sutherland. He went on to write four more bestselling thrillers: Triple; The Key to Rebecca; The Man from St. Petersburg; and Lie Down with Lions. For a while he abandoned the straightforward spy genre, but his stories still had powerful narrative drive, strong women characters, and elements of suspense and intrigue. You can find a collection of Ken Follet signed books below this author biography. Follett is married to Barbara Follett, a political activist who was the Member of Parliament for Stevenage in Hertfordshire for thirteen years and Minister for Culture in the government of Gordon Brown. They divide their time between Stevenage, London, and Antigua. Ken Follett is a lover of Shakespeare, and is often to be seen at London productions of the Bard's plays. An enthusiastic amateur musician, he plays bass guitar in a band called Damn Right I Got the Blues, and appears occasionally with the folk group Clog Iron playing a bass balalaika. Author Signed Hardcover Book. 2000 NY: Dutton Book Club Edition, first printing, mint, new/unread, flawless dust jacket, signed by author. Each dust jacket is protected in an acid-free archival quality acetate cover. Author Signed Hardcover Book. 2000 NY: Dutton First edition, first printing, mint, new/unread, flawless dust jacket, signed by author. Each dust jacket is protected in an acid-free archival quality acetate cover. First Edition UK Hardcover Book. September 2017 LON: Macmillan First UK edition, first printing, mint, new/unread in a flawless dust jacket. Each dust jacket is protected in an acid-free archival quality acetate cover. Signed First Edition UK Hardcover Book. September 2017 LON: Macmillan First UK edition, first printing, mint, new/unread in a flawless dust jacket, signed by the author. Each dust jacket is protected in an acid-free archival quality acetate cover. Author Signed Hardcover Book 1993 NY: Delacorte Press First edition, first printing, mint, new/unread in a flawless dust jacket, author signed bookplate on bibliography page facing title page. Each dust jacket is protected in an acid-free archival quality acetate cover. Author Signed Hardcover Book. September 2014 NY: Penguin First edition, later printing, fine in a fine dust jacket, signed by the author, remainder marked. Each dust jacket is protected in an acid-free archival quality acetate cover. Limited Numbered UK Hardcover Book. September 2010 LION: Macmillan Limited UK edition, later printing, mint, new/unread in a flawless dust jacket, numbered and signed by the author in matching pictorial slipcase (small bump to bottom box edge). Author Signed Hardcover Book. 1998 NY: Crown First edition, first printing, fine in a fine dust jacket, signed by author. Each dust jacket is protected in an acid-free archival quality acetate cover. Signed First Edition Book. 1991 NY: HarperCollins First edition, first printing, mint, new/unread in a flawless dust jacket, signed by the author "Merry Christmas Ken Follett." 1995 NY: Crown First edition, first printing, fine in a fine dust jacket, signed by the author. Each dust jacket is protected in an acid-free archival quality acetate cover. 2004 NY: Dutton First edition, first printing, mint, new/unread in a flawless dust jacket. Author Signed Hardcover Book. 2004 NY: Dutton First edition, first printing, mint, new/unread in a flawless dust jacket, signed by the author. Each dust jacket is protected in an acid-free archival quality acetate cover. Author Signed Hardcover Book. 2004 NY: Dutton First edition, first printing, fine in a fine dust jacket, signed by the author. Each dust jacket is protected in an acid-free archival quality acetate cover. Hardcover Book. September 2012 NY: Penguin Signed first edition, first printing, mint, new/unread in a flawless dust jacket. Each dust jacket is protected in an acid-free archival quality acetate cover. Author Signed Trade Paper 2012 NY: New American Library First Trade Paperback edition, first printing, mint, new/unread in pictorial wraps, signed by the author. Author Signed Trade Paper 2012 NY: New American Library First Trade Paperback edition, first printing, fine in average pictorial wrappers (crease to front), signed by the author.